Q Can I eat the Passion fruit on my plant? How can I tell if it is ripe? Q Can you ID my Passion flower/Passiflora/Passionflower for me? A I can try but better still is to join the Passiflora Facebook Group and ask over 4300 people! Passiflora ‘Amethyst’ Often known incorrectly as P. ‘Lavender Lady’. Passiflora caerulea The Common blue Passion Flower, above. Passiflora ‘Constance Eliott‘ The Common Passion Flower (white flower). Passiflora incarnata or Passiflora ‘Incense’ To distinguish P. incarnata from P. ‘Incense’ is usually easy. P. incarnata, above image © Hal Love, always has its petiole glands (little bumps) at the end of the petiole, hard up against the leaf. It usually has three lobed leaves but may have five. P. ‘Incense’ has a pair of petiole glands half way up the petiole and usually has five lobed leaves but occasionally three. Passiflora x violacea A group of very similar crosses go under this name. Q It’s not one of the above so how can I identify it? A There are over 576 known species and over 700 named hybrids. Accordingly ID from leaf shape alone is rarely reliable. So be patient if possible and wait until your plant flowers before asking the Passiflora Facebook Group for ID. Then at minimum send a picture or link showing the whole leaf and its petiole & the flower. 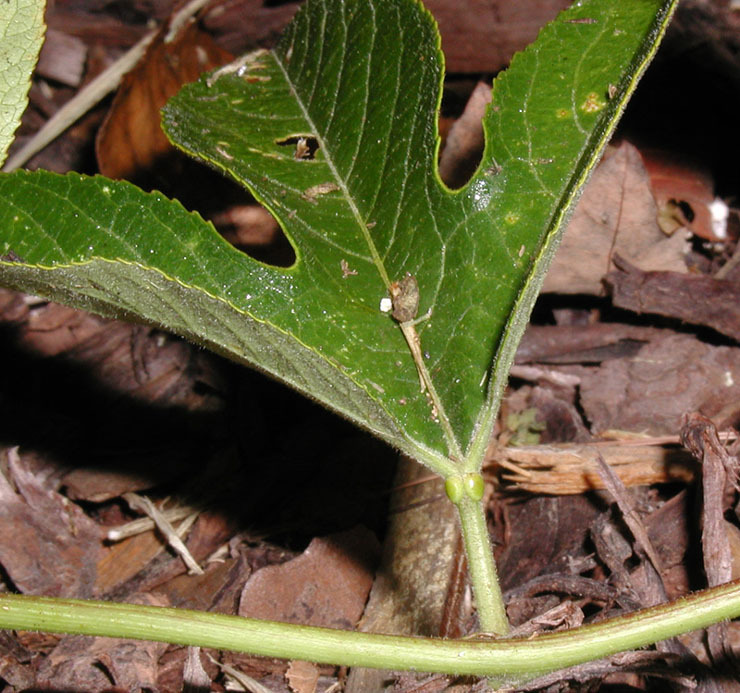 The petiole is the bit of stem that connects the leaf to the plant. The petiole glands are little bumps/stalks, as shown above, that secrete nectar. They are very useful to help ID. 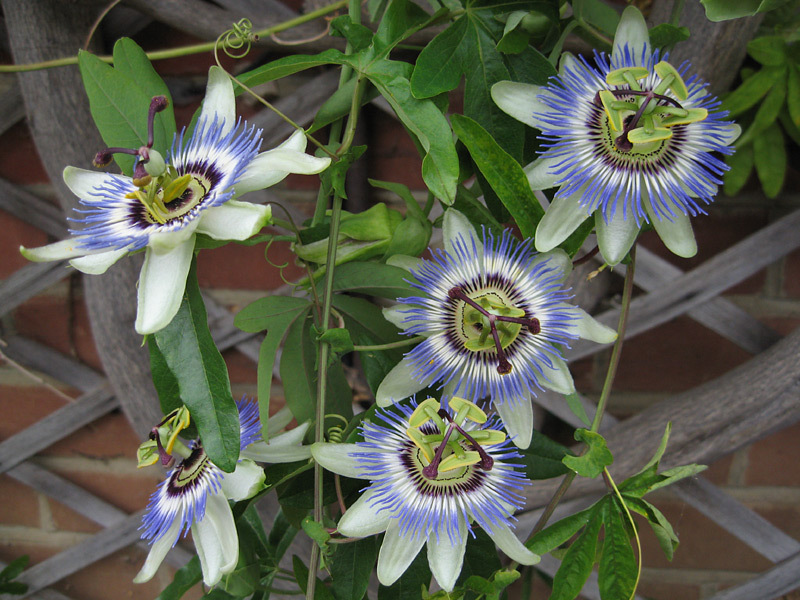 See Passiflora ‘Amethyst’ for an example of a good range of pictures. Q Can you ID this seed for me? A As there are well over thousand hybrids and species best advice, although many seed are distinctive is germinate it. Q I am not sure if my plant is labelled correctly? A Passiflora often have incorrect identification even by reputable nurseries & websites. Even experts sometimes struggle with rare or very similar species. Plants and especially seed from eBay can also throw up a few surprises! Never buy hybrid seed from whatever source, it may be from the hybrid as described but will probably not come up the same as it and is likely to be inferior. Hybrids should always be bought as plants which are grown from cuttings from the original plant.